Join us for a reception celebrating the re-installation of our Artist's Corner! 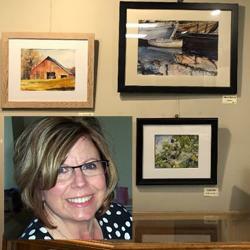 Currently on display are the works of Kathy Lyn Gidley-Newby. Kathy and a few of her works. See many more at the reception. I have been drawing and painting for as long as I can remember. As soon as I could hold a pencil my mother taught me everything she knew about art. At the age of 8 she enrolled me in art lessons with local artist and teacher Marjorie Mankin. From that point on it has been a journey of lessons, workshops, books, DVD's, and a lot of trial and error. I have been blessed with a few awards and honors along the way. I paint for the joy of capturing a special feeling or moment in time. I love the special glow when the morning or evening sun shines through a flower petal or lands on a hillside, or kisses a loved one on the cheek. Let your paint brushes dance.